The next time you dine out with your buddies, don’t forget to take your four-legged mates along. These cafes and restaurants in the city are welcoming pets and will make them feel comfortable too, while you enjoy your food and conversations with your squad. So, next time your pooch makes a sad face when you step out, take them with you and miss out on nothing. Goan shacks and rustic surroundings with enough space for doggo to run around and roll is what you will find at Cafe De Loco. 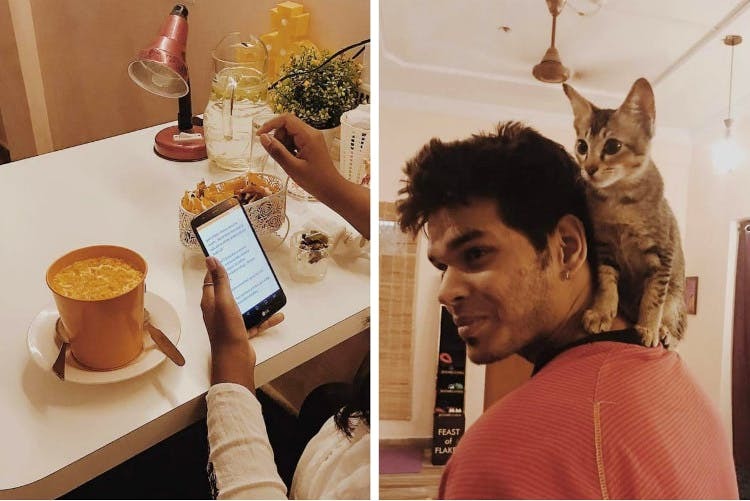 Located in Gachibowli, this cafe aims to help people connect better with each other and their pets. They have a separate pet kitchen that offers pet approved biryani, meat loaf and French toast. They also have a pet school where your pooch can socialise with other fur balls all day long while you enjoy your time with your friends. This quaint cafe has a lot of outdoor space with a good amount of greenery and plants for your pooches and kitties to run around and play. The peaceful ambience demands a cup of coffee while your pet has fun. Also, check out their home studio while here and get quirky products for your space. Smart Alec is a cafe in Jubilee Hills that is actually a house turned into a deli with classy yet simple decor. This place has a unique menu devoid of animal or dairy products and is pet-friendly too. Get your pupper to stroll the terrace seating here and enjoy some delicious vegan food options like the Pink Paradise Pasta and the apple crumble. Another cafe known for its healthy food and animal-loving tendencies is Terassen Cafe in Banjara Hills. This place has water bowls for pets and also has pet adoption posters on a notice-board. While their all vegan menu has delicious options like peanut butter and vegan chocolate sandwich, you should go here to spend some quality time with your pet and homely vibes. This bungalow turned chic coffee house has well done up outdoor and indoor seating, where your companion can roam around comfortably. Relish your pet’s company as much as you enjoy your fresh nitro cold brew coffee and some delicious Continental food. They also have a lot of options for readers who want to just have some quiet time while their pet gets to relax too. This Sainikpuri cafe is a favourite among city folk who often go there with big groups and enjoy board games, yummy food (we reckon you go for the veg or chicken platter with peri peri sauce) and some coffee too. While they are having fun, their pets are not left behind because this cafe allows them too. So, go here with your doggo or kitty and let them have a good time too. This aesthetic Madhapur Cafe seems to be full of surprises, what with a boutique sharing space with it and also with it being pet friendly. Take your cats and dogs here and have some fun lime in the outdoor area by the swing and bird houses. Munch on your pizza slice or read some books while your fur baby can play around. Whether you just want to hang out with your pets or are looking for a daycare centre which takes care of your fur-balls, you totally should check out The Pet Cafe, in Banjara Hills. We walked into a hall with a long bone shaped, high seat table and minimal but cute decor. With quirky lights, humorous animal posters, vibrant painting against soft colours on walls, it has nailed the homely vibe. So, your doggo and kitties can feel at home away from home, as well as indulge in some drool-worthy treats here.